Random Thoughts on Reading and Books - Life is so full of tae! - I love to read. - I read whatever I get my hands on. - Although I'm not a particularly big reader. I have an inconsistent reading habit. I may read 10 books in a month or I don't read anything at all. - I may be a fast reader that I can devour a 750-page novel in just one day or very slow that a 300-page book might take a month. I guess it depends how much a book can captivate me. - One thing is for sure, I don't leave a book unfinished, no matter how much I struggle getting through to the last page. - I read my school books, BUT only the text books with different stories during my grade school years. - The only school books that I devotedly read during college are the books about Philosophy. - I'm still an old-fashioned reader - I still choose to read on the printed word and keep them. - I haven't fully embraced the era of ebooks. Yet. Or on the second thought, I don't think I'll fully embrace it. I work 8 hours in front of the computer (perhaps more). Another glare from an ereader would be an overkill. - Although there are instances when I have to succumb to ebooks, especially when I can't afford the real book. - If I want to read something especially the over hyped ones I make sure I take hold of it the cheapest possible way, or get it for free. Yes, ebooks are my friend. It actually saved my arse from buying Twilight or 50 Shades. Haha! 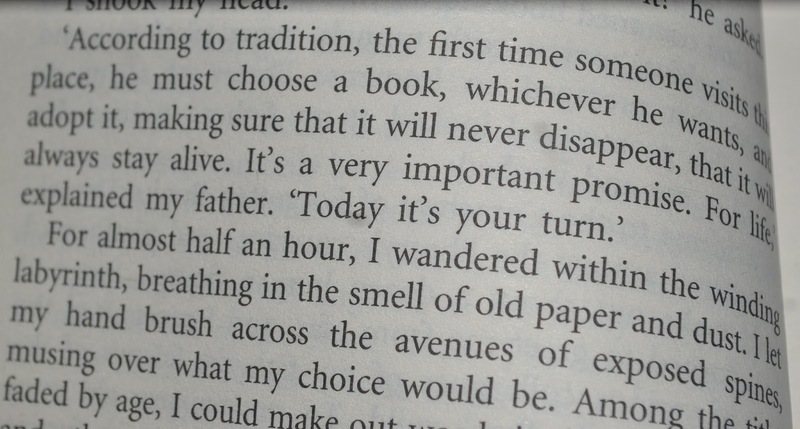 - If a book's worth it, I get the real one, even if I have already read it. New or thrifted, mostly thrifted...whatever my pockets can afford. - I hate it when the back of the book has praises for the author instead of the summary. - Not all best sellers are worth keeping. - The smell of a new book, or the old, especially the ones with yellow pages give me the high. - I'm not a fan of sappy romance novels. So if you're looking for Nicholas Sparks, Danielle Steel, Judith Mcnaught stuff in my book collection, chances are, you won't find any. Not that I hate them. - I will never grow old reading children's stories. - I'm 28 and I'm still hoping for some magic, you know, like owls and letters from Hogwarts. haha! - I can spend all day on a book thrift shop. I will never get used to the smell or skimming my fingers on over a hundreds of books on the rack. - I have this penchant for historical fiction slash Nazi related slash Holocaust novels slash World War II stories and stuff like that. It's one of the genres that has the ability to inflict emotional trauma on me from the hands of the paperback. Besides, I have this liking on loathing Hitler and his mustache. - I cried over a book. - I couldn't count how many times I have reread Harry Potter. It still feels like I couldn't move on that it's over. - I'm bad at making book reviews, as bad as I am making a food review. Heck, I'm actually bad at making any reviews. I guess, I can never be too serious to write one. - Although I actually make reviews, but I don't type out loud. Not at least. Just loud enough for the R to hear. - While you hate it when someone tries to start a conversation with you while you're on your headphones, it's no different from reading a book. Just. Leave. Me. Alone. If only it sounds that easy to say without being rude. - I would love to receive books as gifts! - I dog-ear the pages of my book. But you don't want to dog-ear mine, lest you want to unleash the Kraken. Kidding. But don't. Just don't. 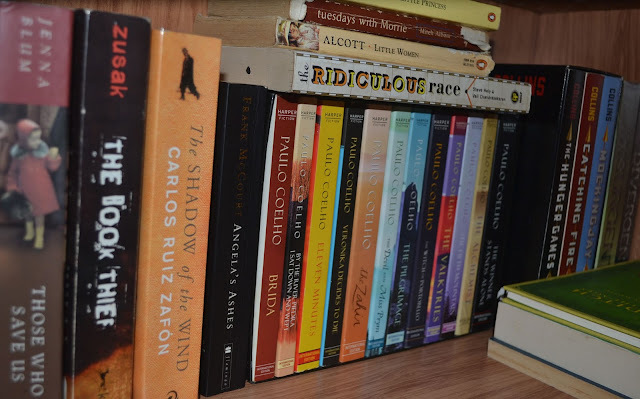 I'm glad to see "The Book Thief" on your shelf. Try reading "Brave New World", "1984", "Robinson Crusoe", "Treasure Island" and "Downsiders". I also have a gazillion of rules about reading, like don't ever put creases on the spine, cover it with plastic but never tape it and always use a bookmark. And those are only a few. I've been reading since the third grade and I'm also not into romances. I prefer young adult books and I'm also a sucker for WWII books. I'm a literature teacher, so a person who loves books is an automatic friend of mine. Actually, my students' books are pretty decorated (far more than just dog-ears) because they're supposed to underline or highlight words they do not know so they can put them in their LDN (Language Discovery Notebook). 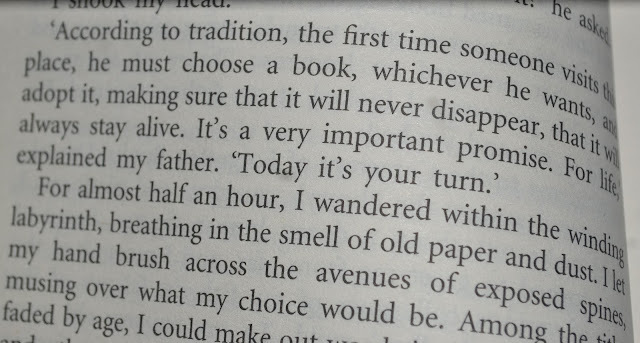 I actually have the Gone With the Wind book, it's way too thick for me to even lug it around so my reading is chop-chop. But I like it, it take me a lot of time though because whenever I read these sort of books, I tend to imagine the culture, the speech and way of communication with each other, even the facial expressions sometimes. Nice post.